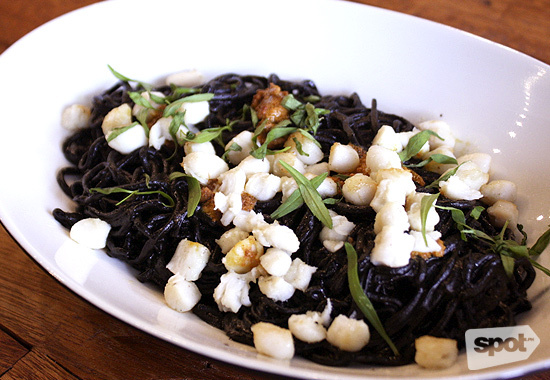 (SPOT.ph) In a world where dishes always have look paparazzi-ready, squid ink seems to have been left in the sidelines. Not only is the color difficult to style on a plate, the black splatter isn't exactly friendly to fashion. 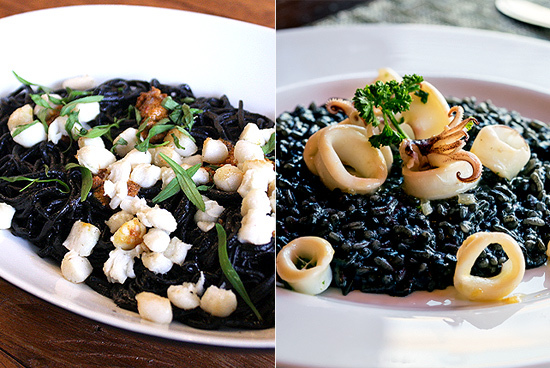 Still, nothing emphasizes the flavors of the sea better than squid ink, which is why we're honoring the 10 dishes that make the mess worth it. In a world of flatlays and Instagram, we still find it beautiful that inner beauty or, in this case, inner taste counts for more than looks. 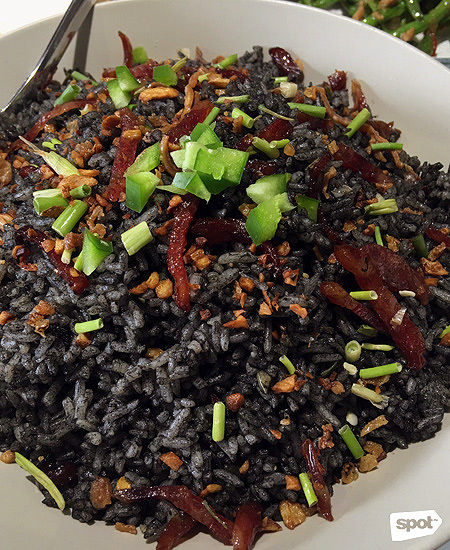 A generous amount of dried squid helps bolster the mild brine of the squid ink that's stubbornly clinging onto the rice. There's no need to check the mirror every few bites with this one. The black hue sticks to the grain and not to your teeth. Leeks put up some freshness, Chinese chorizo some sweetness. The best part is the fried chunks of garlic, which rolls out a bold punch. This should seriously come with a bib. 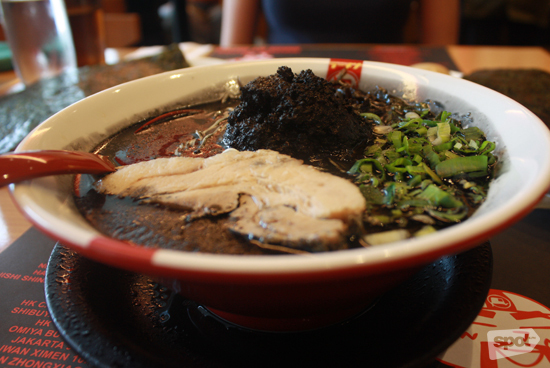 You'll be splattering black broth everywhere as you enjoy the briny goodness of Ramen Nagi's Black King. This ramen chain knows how to slap you in the face with that seafood flavor. You can pick your own noodles and toppings, but every bowl unfailingly comes with a black ball of minced pork and spices. 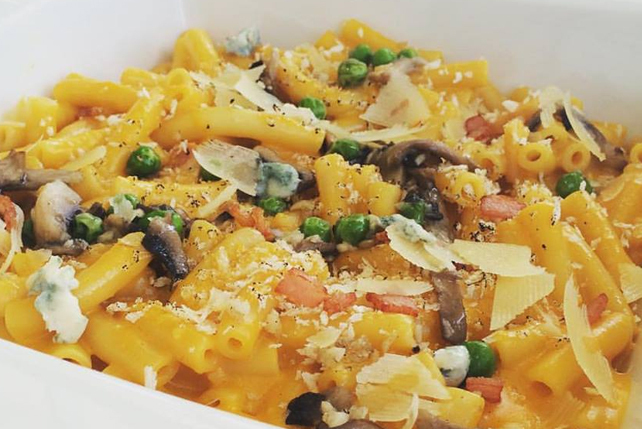 Don't bring a date so you can ask for more garlic. 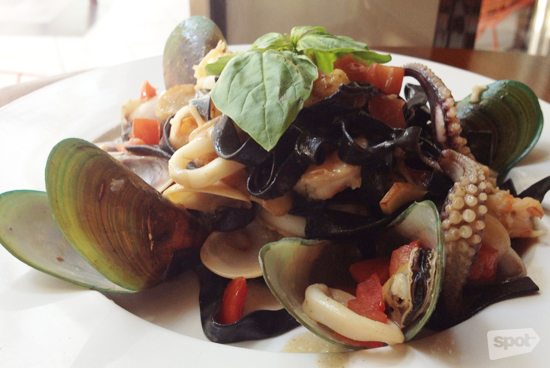 Squid ink leans towards gentler notes; it's assertive but never aggressive. In Earth Kitchen's case, aligue works overtime to bring out that delightfully fishy flavor. It's hard to ignore the handful of scallops they toss in there as well. Nuance takes this black beauty a long way. The whiff of anise liqueur and mild chilies give what could've been a one-note dish some delicious sass. Earth Kitchen has branches at White Plains, Quezon City; and Bonifacio High Street Central, Bonifacio Global City. Read more about Earth Kitchen. Boracay made the Chori-Burger famous, so it only seems fitting that Your Local added a bit of a sea element to their rendition. 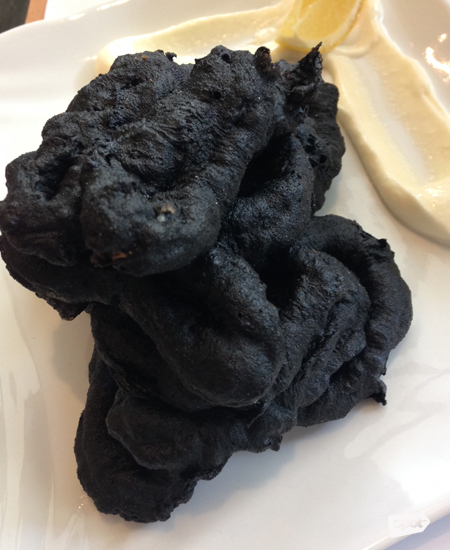 The squid ink shows up in their gorgeous black buns. In between, you'll find a pile of burnt onions, homemade chorizo jam, homemade chorizo, pepperoncini-speckled cream cheese, arugula, and a sunny egg. It may have been inspired by the beach, but we'll actually stay in the city for this. Your Local is at G/F Universal LMS Building, 106 Esteban Street, Legazpi Village, Makati City. Read more about Your Local. This dish won't leave you feeling shortchanged. 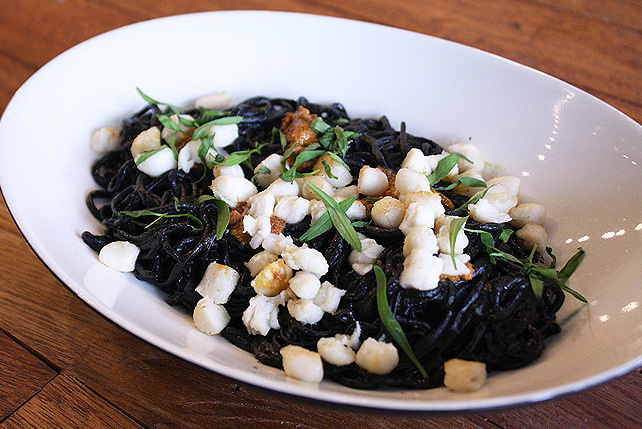 In fact, you'd be hard-pressed to find the flat black noodles within the tangle of seafood. But they're there. Just dig deep. Woodfire isn't abashed by the fishiness of squid ink and this rather underrated restaurant flaunts probably the boldest flavor in the bunch. You get that distinct taste within the pasta itself and the dab of lemon aglio olio bursts in with a bit of brightness. Woodfire certainly knows how to maximize flavors—while minimizing mess. Woodfire Bistro is at Joya Lofts & Towers, Rockwell, Makati City. Read more about Woodfire. 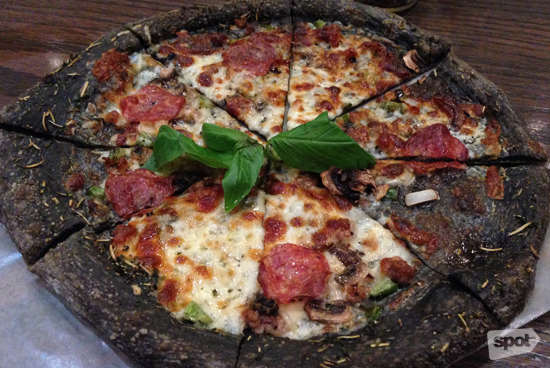 It's easy to think that this pizza was left a little too long in the oven, but that's not the case here at all. 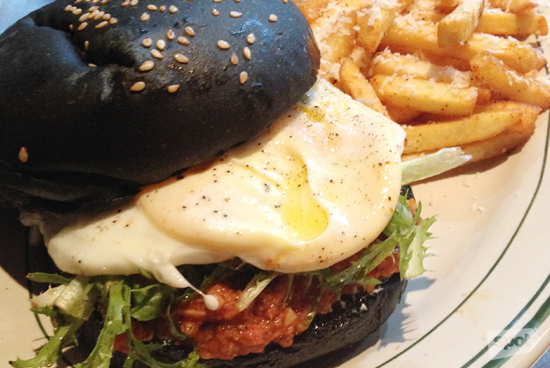 Village Tavern injects personality into their crust with a mild dose of mess-free squid ink. It gives a nice base to the intense but usual combination of Gruyere, Parmesan, mozzarella, pepperoni, bell peppers, onions, basil, and tomatoes. 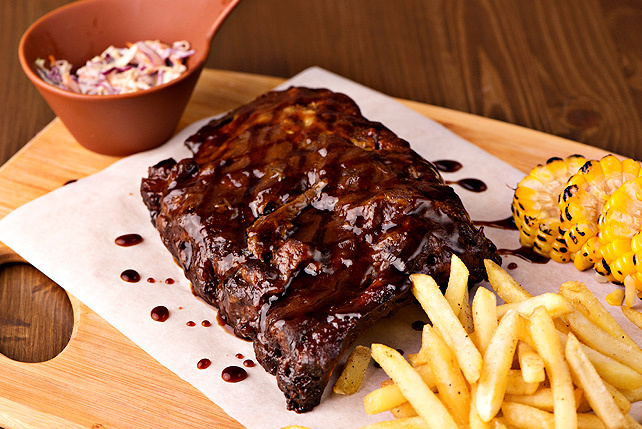 Village Tavern is at Bonifacio High Street Central, Bonifacio Global City. Read more about Village Tavern. As much loyalty as we have for rice, we have to turn to these thin noodles when we want to satiate some squid-ink cravings. The smooth and slender strands are so receptive to the black sauce, pumping in that squid-y flavor in every slurp. Chef Chele Gonzalez rewards his fideua with large pieces of squid that are cooked to a perfect tenderness so that the texture blends perfectly with the soft starch. ArroZeria has branches at Bonifacio High Street Central, Bonifacio Global City; and Century City Mall, Makati City. Read more about ArroZeria. 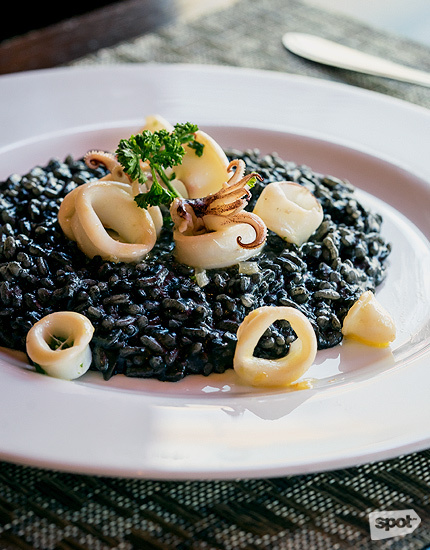 This little Italian nook embraces the subtle beauty of squid ink for their Italian rice dish. With only a squeeze of lemon to coax out a discernible amount of squid flavor, the light tones that they settle with work perfectly with this usually heavy dish. Caffe Puccini is at The Fort Strip, Bonifacio Global City. This fossil-looking appetizer forces you to look for the inner beauty of things. 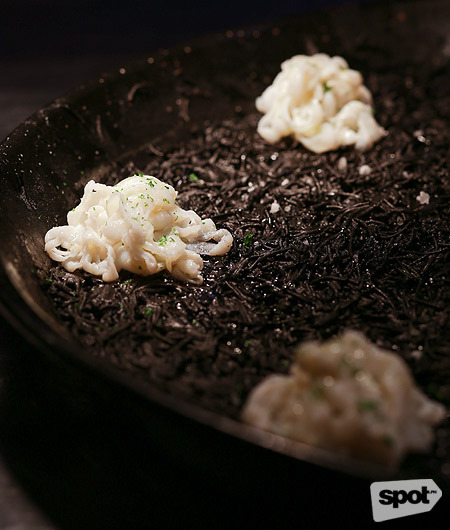 The squid is covered in a crunchy black batter that really imparts a bold umami flavor. Once you get past the look, you'll find that these crispy treats are absolutely habit-forming—especially once you dip them in the lemony aioli dressing. Tapella is at Greenbelt 5, Makati City. Read more about Tapella. 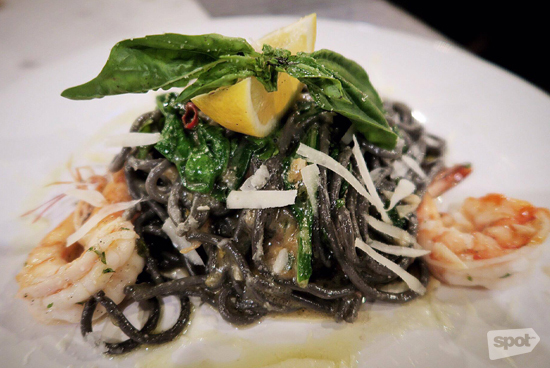 Chef Massimo Veronesi arguably makes some of the best handmade pasta in town and that skill is shown in full effect with his al dente spaghetti, which, in turn, is highlighted by the clever infusion of squid ink. Va Bene mimics the flavors of the sea by tossing in a whole bunch of shrimps, a little bit of lemon, and, to amplify and tie in all those delicious components, uni! Va Bene has branches at Circuit Lane, Makati City; Bonifacio High Street Central, Bonifacio Global City; and Petron Dasmariñas, Makati City. Read more about Va Bene.